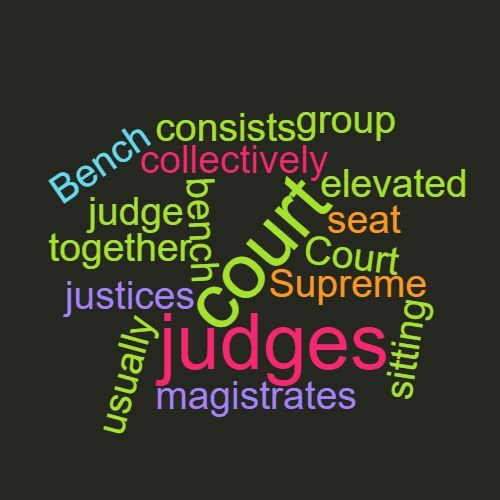 Definition: 1) The seat of a judge or a panel of judges in court which is usually elevated so that the judge can see the whole court. Bench literally means a long type of seat and historically this is what judges would sit on. 2) A group of judges or magistrates’ sitting together in court. 3) All judges, collectively. IMPORTANT NOTE! : In the UK phrases you may have heard in US TV dramas such as ‘permission to approach the bench’ are not used in court. Example: Some people wish to increase diversity on the bench. This word features in Episode 48 of the Study Legal English Podcast.